I traced the Hero Arts Classic Tea Flower (H5577) onto some vellum and then using a stylus to emboss it. It was a technique that Dawn Woleslagle of Wplus9 taught on Day 2 of Class. It is also *watercolored* with Copics. Truly an incredible technique. This class was AWESOME!! If you have never taken a class at Online Card Classes I encourage you to. They are worth every penny. You can take them at any time. Even though the last day of class is tomorrow you can still take the class at your own pace. You just won't be eligible for prizes or to have teacher feedback via the message boards. I am still trying to catch up on a few other classes that I never got to take when they were live. Well that is it for me today. Please visit often, follow in a reader, sign up via e-mail. I have so much to share. I am not going to be posting just cards anymore. I have been up to so much since I left a year ago. I have all kinds of home decor projects to share, lots of videos to come and lots of tutorials. I hope you will stick around! 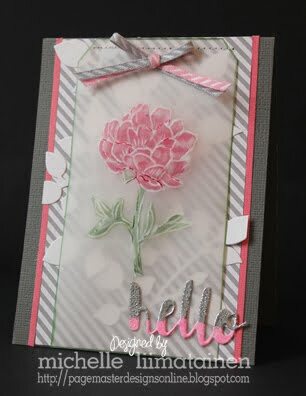 Pretty card!! Glad to see you posting again! !